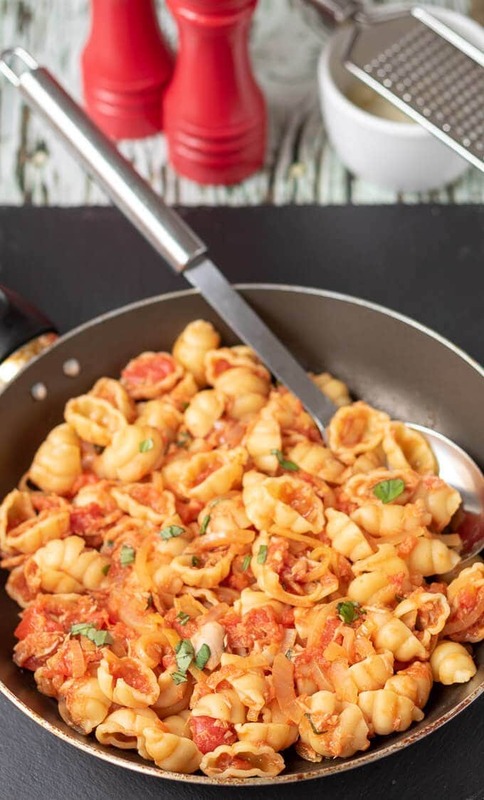 Tuna tomato pasta is a delicious healthy and easy recipe that only takes 20 minutes to make. With just a few basic ingredients it’s budget friendly too! 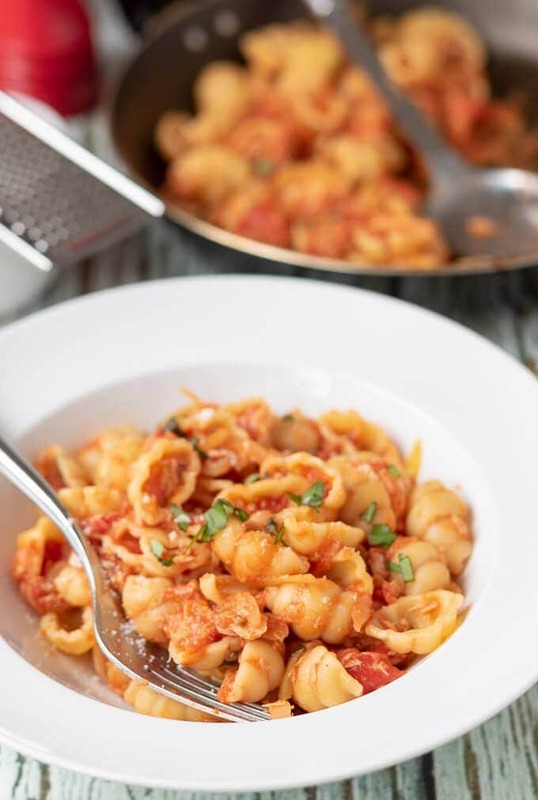 Folks, this tuna tomato pasta is a great recipe if you’re still feeling the pinch after all the extravagance of Christmas. Also, it’s relatively healthy too as long as you’re using wholemeal pasta as per the recipe rather than white pasta. Not only a perfect delicious budget meal, it’s one that can easily be cooked up when you’re busy and got lots of things going on! This tuna tomato pasta is suitable for lunch or dinner. Just alter your portion sizes depending on which meal you serve it for. You could easily cook this up for dinner and take any “leftovers” into work to heat up for your lunch? I say “leftovers” as that really is a rarity in our house. Even though there’s just the two of us. Well there’s actually three in our house if you include Begbie, our cat. He eats nearly everything and probably would dive into this pasta if we let him! Lady Lynne and I always have stocks of essentials in our kitchen cupboards like pasta, tinned tomatoes and tinned tuna. Its great how those essentials come in handy when you’re least prepared and can be quickly turned into a tasty dish like this quick easy tuna pasta! What’s your quick “go to recipe” that you always have a stock of ingredients for in your kitchen? Get your pasta on first. Whilst your pasta is cooking saute your onion then add your tomotoes. Stir in your tuna, then your cooked pasta and chopped basil. Divide the tuna tomato pasta between two serving bowls and top with the grated parmesan. Bellissimo! 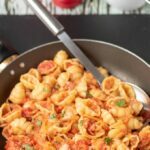 Easy pasta arrabiata recipe is a simple quick healthy meal for four made in less than half an hour. When you’re short on time, but still want those classic Mediterranean flavours, this delicious dish will satisfy all those needs with minimal fuss and effort. Chilli pasta is a quick and easy healthy family meal. Vegetarian, with kidney beans substituted for meat, it’s full of fibre and goodness. Plus it takes just under one hour to serve. Tuna pasta and sweetcorn salad makes for a perfect quick healthy meal. Made with a low calorie dressing and packed with delicious fresh salad ingredients its also great as a packed lunch option too. Folks, I hope you enjoy this amazingly simple tuna tomato pasta recipe! As it’ll soon be February I thought we should have a little bit of a treat after the January health kick. So, next Thursday, I just know you’re going to love my pesto pizza with cherry tomato and basil salad. 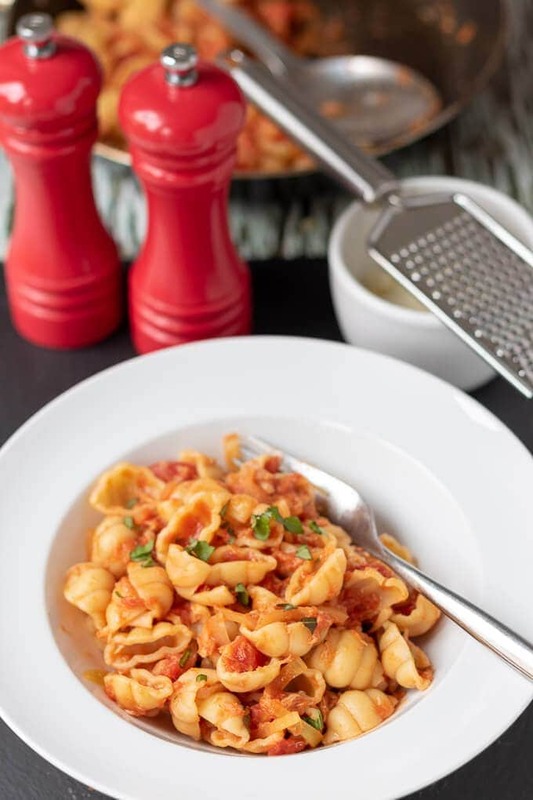 For this tuna tomato pasta recipe you can of course use just normal pasta. But that will make this recipe less healthier and changes the nutritional label below too. 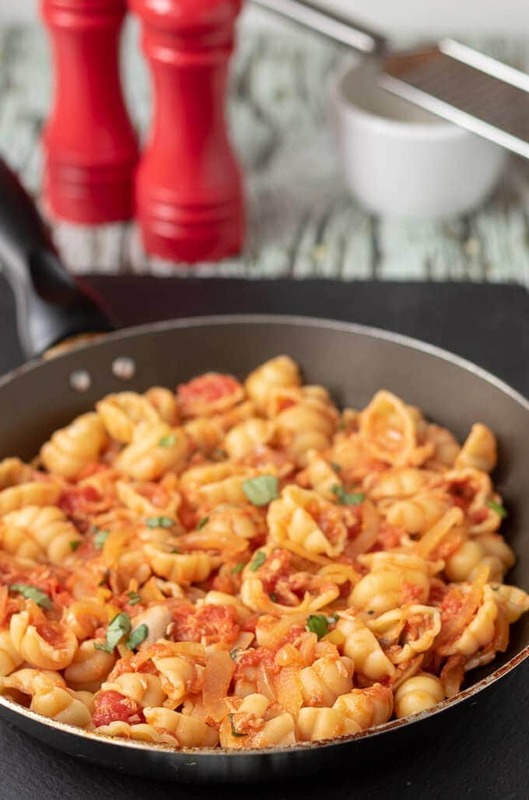 Tuna tomato pasta is a delicious healthy and easy recipe that only takes 20 minutes to make. With just a few basic ingredients it's budget friendly too! Place the pasta in a saucepan of boiling, salted water and cook as per the packet instructions, then drain. While the pasta is cooking continue with the rest of the recipe. Heat the olive oil in a medium sized saucepan, add the onion and sauté for 2 minutes then add the tomatoes and cook for about 10 minutes until soft. Add the drained tuna and stir until warmed through. Then add the drained pasta and freshly chopped basil. Divide between two serving bowls and top with the grated parmesan. You can use ordinary pasta for this but it will make it less healthier and change the nutritional values. Tuna is something I keep on hand. It really comes in handy when we’ve returned from vacation and I need to whip up a good meal without having gone to the grocery store first! 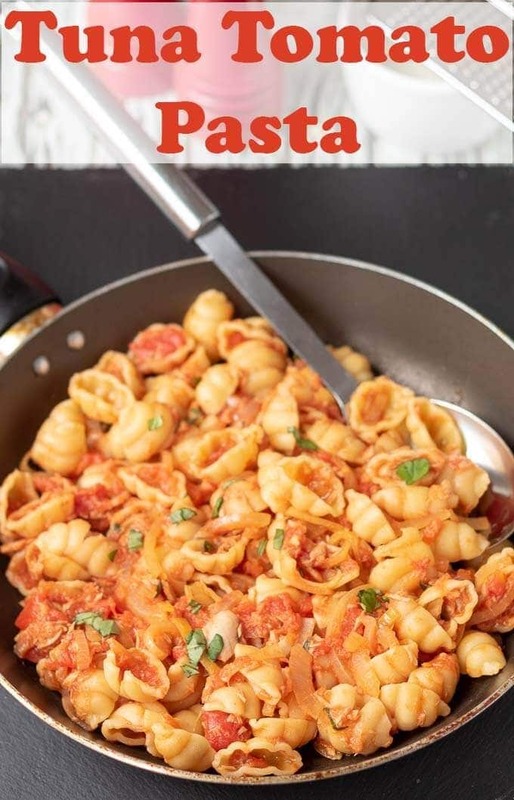 We love pasta with tuna too (Tinned tuna and pasta are things you can always find in our house too), and I make it almost like your recipe suggests – lighly sauteed onions, tomatoes, and tuna. I also like adding sometimes some frozen green peas as they bring up some freshness or black olives. And if you haven’t tried baked tuna pasta (mixed with some cream cheese or/and shredded mozzarella), you should run into the kitchen right away. 🙂 Happy weekend! Ben you have me salivating! Baked tuna pasta is on the menu here for Lynne and I soon. Nice one. Thank you very much. I hope you have a fantastic weekend too. (Oh and thanks so much for the comment and recipe rating too 😀 ). Although pasta is often made at our home but we mostly stick to veg pasta. Your tuna pasta sounds so good and such a healthy option to go for. This is definitely an ideal dinner for you and Robbie whilst Laura is out of town for work. Lynne is often away too and I can make this up for my dinner and then re-heat the other half for my lunch the next day! Neil, I need to see a picture of Begbie! I must have missed your previous posts with your cats! Also, this easy pasta dish sounds delicious! I needed this during these past few days of moving mayham! My go to dish is usually is egg curry and I usually have canned tomatoes in stock for it! Hope you and Lady Lynne are doing well! I think there’s a couple of pictures of Begbie scattered through some recipes posts Shashi. I’ll try and remember to post a pic of him in future when he’s not hiding under the radiators seeking out heat as I said to David in a comment below! Neil – this looks so delicious – i imagine that tuna has Begbie ready to dive in! My go-to in a pinch is chili, since just about everything needed comes in a can. A little leftover roast or chicken added and we have a meal! Thanks for the yummy and quick recipe! Thanks Laura. Funnily enough I’ve just lifted a batch of pre-made turkey chilli out of the freezer for tonights dinner. Chilli is also a favourite here! Shame we’ve got no leftover chicken to add to it though, that would have been had a really nice variation.